Jean: You must understand; I was someone once. Sissy: I thought I was someone now. 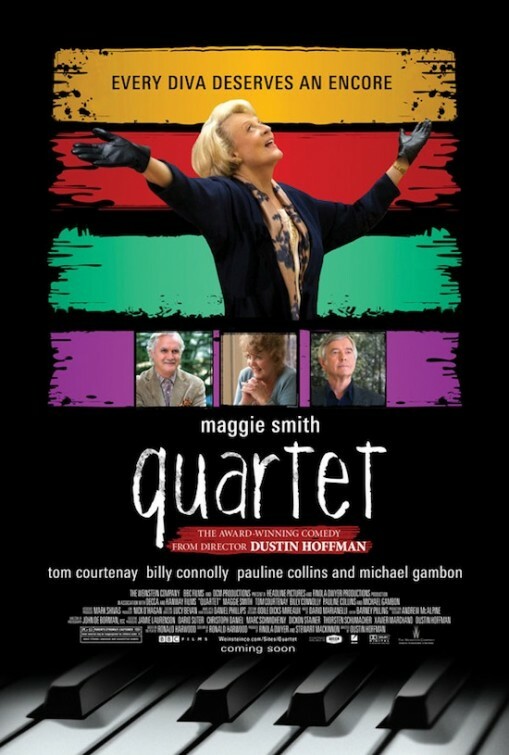 Celebrated and famed actor, Dustin Hoffman, marks his directorial debut with QUARTET, and he does so in as safe a fashion as he possibly could. Based on the stage play of the same name, and written by the same man, Ronald Harwood, QUARTET is one of those delightfully cheery movies about the foibles that befall the aged, as they learn to face their own mortality. Serious ailments, like dementia for instance, become endearing quirks and we laugh, or at least we’re supposed to, when someone forgets what they were going to say or someone else pees themselves. It’s not that death and dying should be portrayed as impending horror but making light of it like this just makes Hoffman seem somewhat in denial about his own life. All the action in QUARTET, confused or otherwise, takes place at Beecham House, an assisted living home for elderly opera singers and musicians. The residents are preparing for their annual concert, a tribute to the famous composer, Verdi, on his birthday. The funds raised at this concert are particularly vital this year, as if they don’t bring in a certain amount, the home might not be able to run for another year. I believe this is also the rough premise of the third STEP UP movie, but I could be mistaken. This year though, the show could stage an operatic coup, if it plays its cards just right. The home’s newest resident, and a highly reluctant one at that, is Jean Horton (Maggie Smith), and her presence at the home completes a famous quartet of singers, whose recording of Verdi’s “Rigoletto” is considered one of the best in history. There is just one tiny problem. Jean no longer sings. As she has gotten older, Jean has noticed the wear on her voice get stronger. And so, one day, she just decided to stop singing altogether. Rather than face the reality of her journey, she would rather remember only the past and pretend like the future isn’t coming. She is a true diva though so this behaviour is entirely acceptable of course. What she, and her fellow house mates are not though, are well fleshed out characters. Instead, Hoffman gives us nothing but saccharine charm that moves along with such plain predictability, that by the time Verdi’s birthday roles around, there is no more mystery to be had. A life without any surprises to look forward to? That sounds like death to me. How many sheep would you give Quartet?